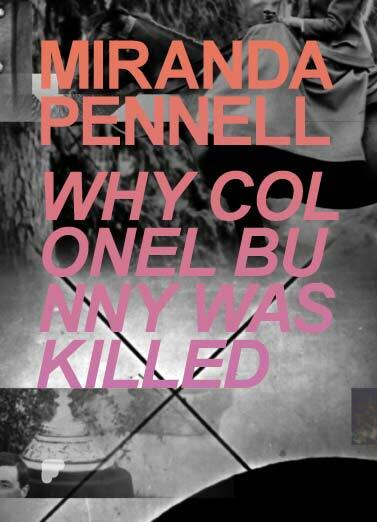 Miranda Pennells Why Colonel Bunny Was Killed, narrates the 1908 memoirs of Theodore Leighton Pennell, Among the Wild Tribes of the Afghan Frontier, through a film work that is entirely constructed from period still photographs that are forensically examined and probed by Pennells camera to reveal the beauty and charm of Army life on the North West frontier of British India, whilst the Afghans, who occupy the shadowy nitrate background, observe yet another colonial misadventure. Miranda Pennell recently screened work at the Glasgow Short Film Festival, the Oberhausen Kurzfilmtage, Germany, the London Film Festival and was awarded Best International Film/Video 2011, at the Courtisane Festival of Film, Ghent. She was born in the United Kingdom and lives and works in London. First Edition of 50 copies Miranda Pennells Why Colonel Bunny Was Killed, narrates the 1908 memoirs of Theodore Leighton Pennell, Among the Wild Tribes of the Afghan Frontier, through a film work that is entirely constructed from period still photographs that are forensically examined and probed by Pennells camera to reveal the beauty and charm of Army life on the North West frontier of British India, whilst the Afghans, who occupy the shadowy nitrate background, observe yet another colonial misadventure. DVD featurette includes a specially commissioned interview with Miranda Pennell at her home in London with David Gale and Mathew Mead, directed by Gordon Shrigley.